The Spring issue of In Bloom, the Bloomfield Libraries’ new quarterly newsletter, has been published. This newsletter feature library news, interviews with community members, technology tips, and other stories. In Bloom issues will be available at both library buildings, as well as various sites around town. 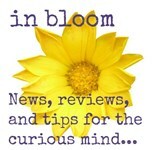 You can also read the current and past issues on the library’s In Bloom website page. This entry was posted in In Bloom on April 9, 2019 .